i've been really focused on the idea lately of spring cleaning, almost to the point where it's become an obsession. i've been spending inordinate amounts of time in the hardware store's paint section ogling new and bright colours and staying up all hours helping my sisters paint their rooms. one of our goals is to re-organize one of their closets - she's got a pressing need for space and i conveniently have a pressing need to make it look pretty. we've recently pulled up her ugly old carpet and replaced it with lovely new laminate flooring and the next victim on our hit-list is the closet. i've been looking through some of martha's organizing and creative ideas and am completely in love with the notion of painting a lil bit of colour in peekaboo places like the closet - it's like a slightly-less-committal solution for my love for bright colours. 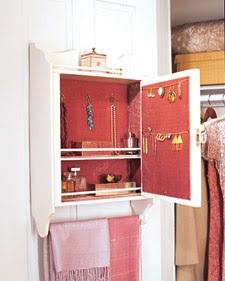 when i came across the picture above, we decided to use it as inspiration for the closet - a lil burst of unexpected pink makes everything just a little bit more fun! i'll be sure to post pics of it when we're done. meanwhile - in the spirit of spring cleaning, what's your best de-cluttering and organizing tip? share it in the comments section and i'll randomly draw a winner on friday to win a set of my favourite lil magnet clips - in any colour of your choosing! I love the idea of a "spot of color" in the closet! Unfortunately, I'm definitely not good at decluttering my space lol. I do however love to use storage containers of all kinds. They're very useful for holding all of my jewelry supplies neatly in one place! I love the idea of peek-a-boo colors! The best organizing tip I have when tackling a big project is to have a goal of only handling each item once. So, you pick something up and immediately decide where it's going or if it's going to be thrown away. No shuffling around allowed! My best organizing tip is "hide" things out in the open. Basically, provide pretty colored bins or decorative baskets for everyday things like remote controllers, cleaning bottles, and magazines. That way, they're out-of-the-way, yet easily accessible. I'm slowly trying to create places for everything. We have a little mail bin right next to the door, lots of hooks for coats and bags, a little bowl for keys and another one for change. Eventually, I think the apartment will keep itself clean if I just make the right nooks for everything. i definitely agree with rachel. providing special little spaces for specific things is the way to go. if everything has its own space, things will just end up there naturally! When I have lots of organizing and cleaning to do after a long work week,the first thing I start with is laundry and the laundry room. Just by gathering,washing, drying and putting away the clothes can make everything seem clean and organized. Space Bags, Space Bags, and more Space Bags! You've probably seen the commercials, where you stuff the bags full and vacuum out the air. They look gimmicky, but I assure you they work WONDERS! Especially when you're closeting the winter clothing, coats, hats, mittens, blankets, etc. They are a super spacesaver at our house, as we have no attic and no spare room(s). I use them to store my son's baby clothes (that I WILL need again someday) and our winter stuff, extra blankets, even my mounds of polyfiber fill for crafting, pretty much anything that's soft and will be stored away for a while. You can get them at Walmart (and maybe Target?) in all different sizes. Works wonders! What a great idea for the color splash! I am very much a neutral person, scared of color. But this idea would be something I could handle! As for organization tips: I'm a super organized person and don't handle clutter very well, unfortunately I haven't ever thought about tips before so sorry if this is lame. When I help other people organize their spaces I find myself always asking "Do you really, REALLY need this? Are you ever going to use it again?" I find these are difficult questions but when you answer them honestly you can drastically reduce the clutter in your space. If you ask yourself if you really need an item before you buy it, you might prevent bringing new items into your space (and save some money too). Like I said, it's kind of lame but may be able to help. If you don't need something (extra clothes, empty picture frames, stashes of untouched items) then consider freecycling it! In the kitchen, I use old quart mason jars for staples like rice, dried beans and tea. That way I can have them in view, remember what I have and give more room for the less attractive items hidden away in cabinets. I also love decorative tins for the same reason. fabulous idea. okay, here's my tip. i leave a large empty basket on my kitchen floor, out of the way, but still handy. it's a great place for random things: perfect for a clean load of laundry, it is my go-to when i'm leaving for a picnic, i load benji's toys in there when company comes and so on. you'll find loads of uses. the important thing is to keep it empty so it can be of use! I love pulling everything and anything "cluttered" and dumping it in the middle of the room and sorting through things one by one! I don't know what's with my blogroll lately, but I've been checking your blog and it's been on the My Story post from Monday every day I check it! I thought it was strange, since you usually blog daily. Anyways, the link still isn't working but I found you another way (: So here I am! My cleaning tip (if only I could stick with it!) is to take care of the little things. Pick up your little bits and pieces as you go and you'll notice that your house and home is so much tidier! My new fave organizational strategy is to APPEAR organized, and slowly i will trick myself into it. outta sight, outta mind, right?! last night i picked up some under the bed totes from target (7.99 each) to put all my crafty/scrapbooking/card making/creative stuff AWAY (and not all over my desk/the floor. having a PLACE for things really helps me out! (p.s. i am so inspired by your blog. keep it up, girl!) :) happy weekend!! I'm probably not the person to give tips. My idea of organizing is...I try to keep most of my house clutter free, but I have a very large pile on my counter of stuff that need to be put away. When the pile gets so high I can't see over it, that's when I know it is time to organize it all. Then it all starts again.